Opened in 1993, L’Albereta is owned by the Moretti Family. Carmen Moretti, Vice Chairman of the Terra Moretti Group and Managing Director of the Resort division had dreamed since childhood of developing a hotel complex dedicated to satisfying the whims of its guests, to maximising free time and to the art of livingd. Travelling with her parents, she had been enchanted by similarly charming homes where every last detail, from the décor to service, from the landscape to the cooking made her feel as welcome and important as when visiting her friends’ houses. 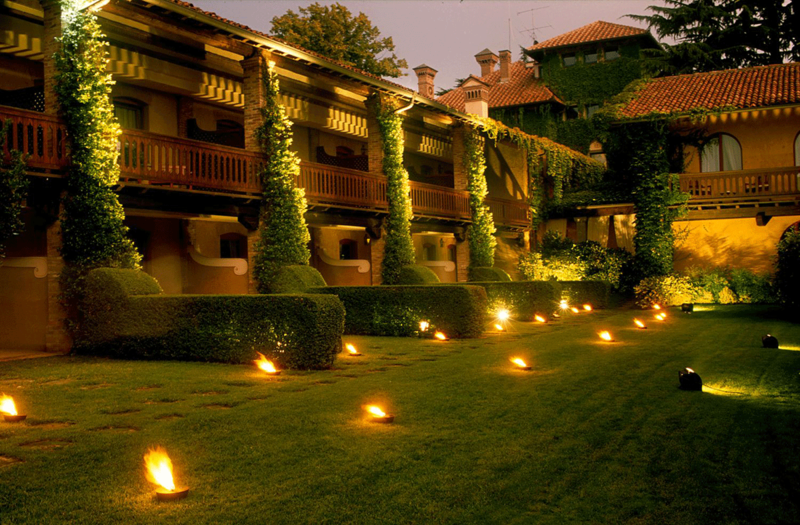 This is what L’Abereta is all about and why we are a member of the prestigious Relais & Châteaux since 1999. As a majestic Neo-Renaissance country house developed on Bellavista hill at the end of the 19th century, L’Albereta was the private home of lawyer Giovanni Cavalleri and his wife Anna, musician and great art and painting enthusiast. The Cavalleri house was an important reference point for the northern Italian artistic and cultural scene during f the first half of the 20th century, a hotbed of new ideas and continuous artistic creativity in the fields of poetry, the pictorial arts and the music. In the early 1990’s the Cavalleri villa was then purchased by the family of Vittorio Moretti. L’Albereta’s success is largely due, since its opening in 1993, to Vittorio Moretti’s eldest child, Carmen. Although a country resort with gourmand restaurant, L’Abereta features a widely renowned wellness and medical SPA, Espace Chenot Health Wellness SPA. Just a few kilometres away from the romantic Lake Iseo, L’Albereta Stands in a truly strategic area of Lombardy where from the biggest art cities in Northern Italy (Milan, Bergamo, Verona, Venice) can be reached in a short time. All possible activities are available, excursions on Lake Iseo, Lake Garda and Lake Como, guided tour of the cities of art, winery tours, shopping. Cabriolet Suite is a unique, very special bedroom with a romantic surprise. At the touch of a button the roof opens to reveal the sky. The balcony faces the surrounding vineyards and Lake Iseo. Marble master bathroom with hydro-massage tub and multifunctional shower. Maty’s Club, the Kids’ Club of L’Albereta, is a place of pure fun, created to welcome children aged 3 and above. A world of games and special activities will treat your children to an unforgettable experience. Open every day, reservation in advance is required. • 6 Classic double rooms, with king or twin beds. Bathroom with shower. Garden view, some with lake view. • 9 Superior rooms, with king or twin beds. Bathroom with shower/tub combination. Garden view, some with lake view. 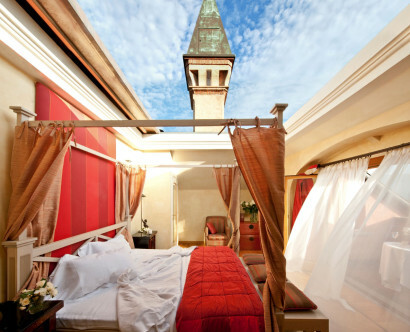 • 18 Deluxe rooms, with king or twin beds. Bathroom with shower/tub combination, some with Jacuzzi. Garden view. • 1 Cabriolet Suite, with kingsize bed. Bathroom with Jacuzzi bath and separate multifunction shower. Lake view. • 9 Junior Suites, with kingsize bed. Bathroom with Jacuzzi bath and separate shower. Garden view. • 2 Contadi Castaldi Family Suite, composed by a twin bedded room with bath with shower connected to a kingsize bed room with bath with tub. Garden view. • 6 Lake Tower Suites, with kingsize bed. Bathroom with Jacuzzi bath and separate multifunction shower. Garden view, some with lake view. • 1 Bellavista Grand Suite, with kingsize bed and living room. Bathroom with Jacuzzi bath. Two terraces with lake view. • LeoneFelice – Opened in 2014, LeoneFelice is a refined restaurant, with a contemporary décor made of the best Italian design. The Executive Chef Fabio Abbattista proposes a cuisine based on the excellence of ingredients, most of which come directly from the hill where L’Albereta is located: here are bred exquisite chickens and rabbits, while vegetables, aromatic herbs and fruits are produced by the family vegetable garden and picked up every day by the kitchen team. • VistaLago Bistrò – Welcomed in the most ancient rooms of this XIX villa, with beautiful frescos and Latin motti about the art of hospitality, the VistaLago bistrò is the vibrant hearth of the hotel. Perfect from the breakfast to the after dinner, it proposes delicious snacks all day long and a special selection of typical Italian and regional dishes for lunch and dinner, such as Tonnarelli pasta with pecorino cheese and black pepper sauce and Milanese veal chop with fresh lettuce. Its amazing terrace seems to float among the green of the park, offering a breath-taking view on the Iseo Lake and Montisola island. • La Filiale – In March 2017, L’Albereta launches a new, outstanding culinary experience in its park: the kiosk “La Filiale” opens with a menu entirely dedicated to pizza by Franco Pepe. 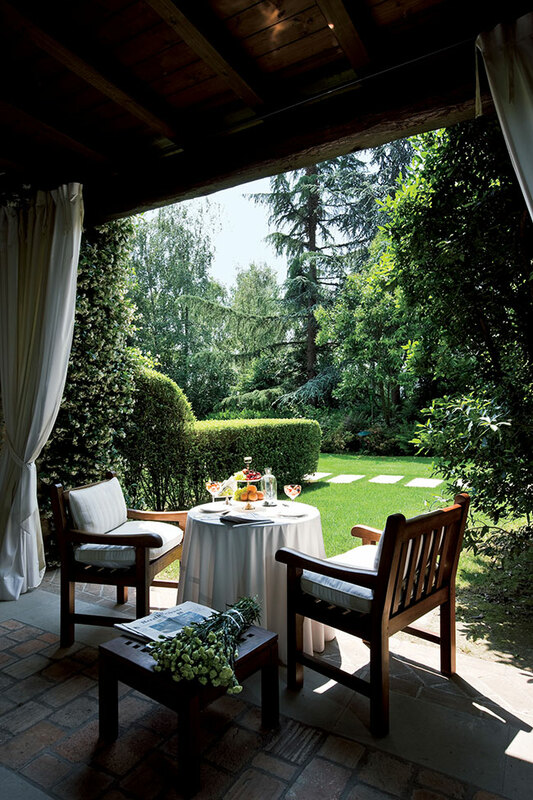 At La Filiale, guests enjoy a unique dining experience combined with exceptional wines from Franciacorta and beyond. 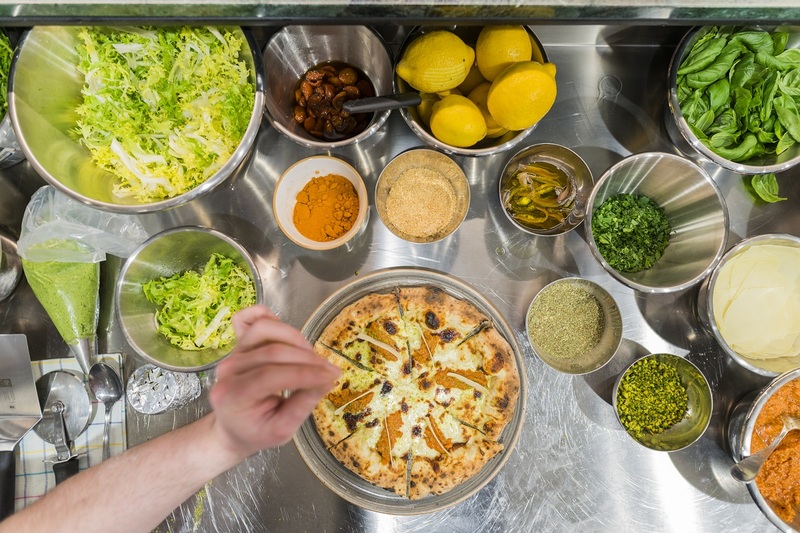 Sit at the spacious counter with open kitchen and enjoy a “pizza a libretto” accompanied by a glass of wine, or take a seat upstairs and order one of the famous pizzas of the Pepe menu, such as the “wrong Margherita” and the fried pizza. Do not miss the Curtefranca pizza made with fatulì, a typical cheese that is a gem of our territory. • Wellness Restaurant – Reserved for guests enjoying treatments at the Espace Chenot Health Wellness SPA, and who want to take the opportunity to eat gourmet food and yet diet oriented meals. 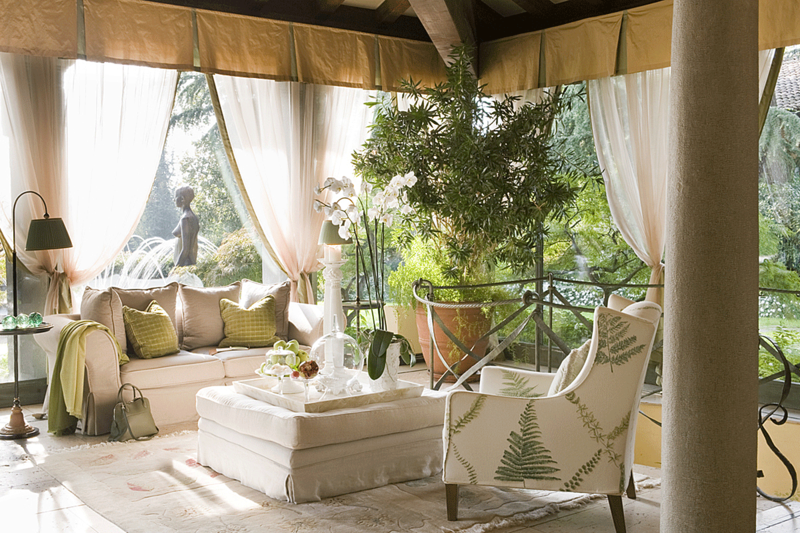 • The Greeneige Lounge – It is the heart of L’Albereta, an authentic lounge, intimate and warm, to be enjoyed at all times, whether at breakfast time or when relaxing after dinner. 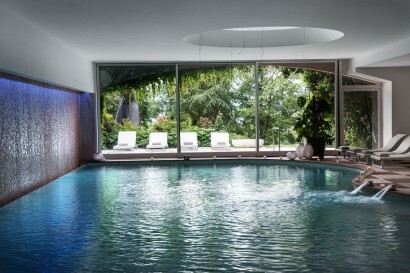 • Espace Chenot Health Wellness SPA is one of Chenot’s only two medical & wellness spas in Italy, with a 30-strong team of highly qualified doctors, therapists, dieticians, osteopaths, beauticians, and of course receptionists and welcoming team. 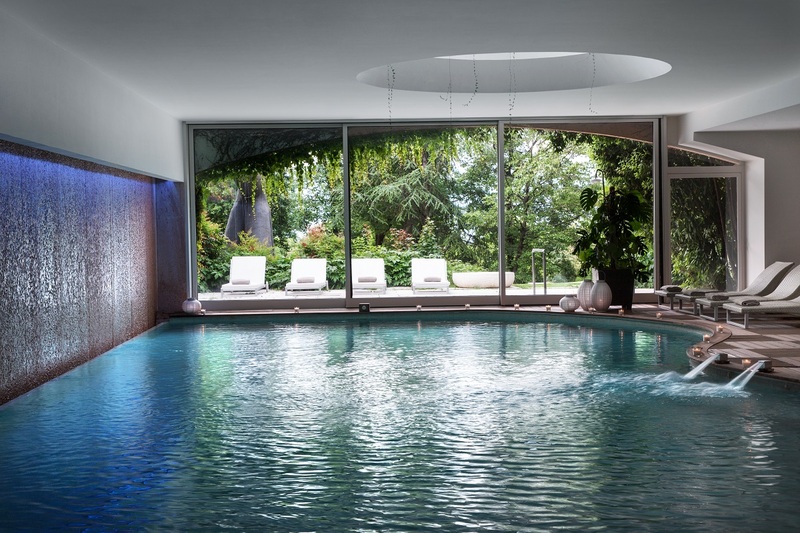 2,000 square metres of pure vitality and tailored wellness, devoted to those who want to recover their energies and rediscover – or maintain – the perfect physical and mental shape. There are personalised treatment programmes for 3, 4 and 7 days, defined to meet the specific requirements of each individual client following medical checks and tests to identify the person’s state of health. There is also a huge selection of beauty treatments, including the latest treatments using the laser therapy technique, which is used to treat many problems ranging from cutaneous relaxation to couperose skin. • Hamman, sauna and Kneipp pool. L’Albereta has six different modular rooms, distinctive for their tasteful décor and equipped with cutting-edge equipment and Wi-Fi cabling, that hold up to 190 guests. They can also be customised in every minimal detail to satisfy all requirements. They offer the perfect context for all kinds of event or occasion: business meetings, important ceremonies, parties, concerts, fashion shows, exhibitions and showrooms. L’Albereta is the ideal location for weddings too, the highly specialised staff will accompany you with discretion and competence through every stage of arrangement, advising you on the ideal solutions for every need: from the flower accents and the choice of menus of gourmet marvels to the details of the mise-en-place and the particular perfume that you may choose as the olfactory signature of the event.